I'm new to the Post but not new to Ponies! I'm a journalist from Northeast Texas (howdy! ) who collects, buys, sells and trades '80s toys, including My Little Pony! Obviously, I have a soft spot for MLP. You may have seen me around on Facebook, Etsy, etc... looking to branch out and find additional pony friends on here! 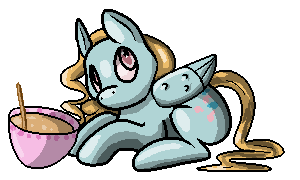 My favorite ponies are Sweet Stuff, Medley and Magic Star. Yay a Texan. I am from South East Texas. Its nice to meet you. I love Sweet Stuff too. I am Christian that shares the same importance in Christ also. Hope you enjoy the forum. Oh and by the way I am dying over your avatar. Its gorgeous. Nice to meet you too Tulagirl! Always great to meet fellow Texan MLP folks! How wonderful to meet you! I am in northeast Texas myself, up near the Red River. We're always wishing we could do a Texan meetup! Hi FooFoo and RedTabbyKitty! Nice to meet y'all! Yes, FooFoo that would be amazing! I know a few TX MLP collectors via Facebook..there's a FB group page if you surf around there! Greetings and hello's! I am Michelle Lysyk from Calgary, Canada! Beautiful username and avatar! Rock-on pony! Hi Autumn Rose! Nice to meet you! Thanks for the compliment. I can't take credit for the art..heehe I wish I were that talented! Hiya, fellow pony person! I am from Texas too, btw. Nice to meet you, Sweetie! There seems to be maaaaaaany Texas people in here I'm little bit more to the north, Finland to be exact . Hi Sky and h1m3! Nice to meet y'all! Thanks for the compliment on the avatar! I love it too! Yea for Finland!! You are so close to Texas I bet you can smell the BBQ from your back yard. Every day, eeevery day I can say it is my perfume. You guys should stop that BBQ for a while so I can try some other perfumes for a change. Stop BBQing? Do you want us to lose our Official Texan Cards? I will make a yummy pumpkin pie. You will smell deeeeelish! C'mon, Sweet_Stuff, help me make some tasty pies! Which we will then eat! Ohhhh.. yummy Pumpkin pie and BBQ?! I just ate lunch but now y'all are making me hungry again! Yes, bunny, I can help you eat them.. not necessarily make them!